Stacey Abrams, the 44-year-old Spelman graduate, shocked the political establishment when she beat out her opponent, former state Rep. Stacey Evans, to win the Georgia Democratic gubernatorial primary. Abrams, will now face off against a Republican in the general election in November. If she is successful, she will become the nation’s first Black female governor. 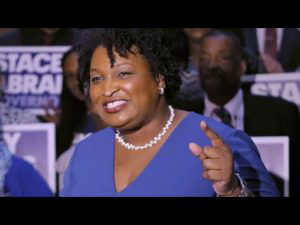 “We are writing the next chapter of Georgia history, where no one is unseen, no one is unheard and no one is uninspired,” said Abrams, a 1995 graduate of the historically Black women’s college in Atlanta. Prior to her run for office, Abrams served as the minority leader of the Georgia Statehouse and garnered the support of Hillary Clinton and presidential hopefuls Cory Booker, Bernie Sanders, and Kamala Harris. Still, Abrams has an uphill battle. A Democrat has not held the governor’s mansion since 2003. It is unclear who Abrams will run against. Lt. Gov Casey Cagle won the Republican primary on Tuesday, but will face Georgia’s secretary of state Brian Kemp in a run-off on July 24. Dr. Khalilah L. Brown-Dean, an associate professor of political science at Quinnipiac University said that she is encouraged by Abrams’ win. Brown-Dean said that the path to victory in the general election will be tenuous and no one should assume that her win on Tuesday signals the end of vicious battles over race, class, and gender that have long characterized Georgia politics. Dr. Ravi Perry, associate professor and chair of the Department of Political Science at Virginia Commonwealth University said that Abrams’ win is significant, adding that while her victory was not a surprise to pollsters and close campaign observers, her margin of victory with 53% suggests that she and her message has broad appeal. Perry said that Abrams has not run from either wing of the Democratic Party – suggesting that a unified Party can win big in regions where the population is diverse in every way – from liberal city dwellers to rural farmers. Perry said that Abrams has been successful in galvanizing the young vote as well.